The Dennos Museum in Traverse City Michigan is hosting Homage: Inspired by Outstanding Canadian Women featuring art necklaces by Canadian jeweler Donald Stuart. Most Americans probably struggle to name even five Canadian women, but Canadian jeweler Donald Stuart provides us with a beautiful cheat-sheet in his tribute to 40 of his country’s many outstanding women of the past and present. Now on display at the Dennos Museum Center in Traverse City, Michigan, Homage: Inspired by Outstanding Canadian Women includes 40 framed neckpieces, a sketch and biography of each woman honored, and a brief note by Stuart on his inspiration and the (often unusual) materials used in the piece. Although he didn’t explicitly say so, I get the sense that Stuart went into this project with a few specific women in mind. However, it seems it didn’t take long for him to realize just how large the field of “outstanding” Canadian women was. He readily admits that one of his biggest challenges is choosing which women to include when there are so many worthy options! In choosing his subjects, he’s tried to create a balance across both fields of experience and between traditionally famous women like silent film star, movie producer, studio founder, and America’s Sweetheart Mary Pickford and women who’ve made extremely important contributions to society, but may not be well known outside their region or field of expertise like medical missionary Leonora King or geologist and diamond mine founder Eira Thomas. He’s also tried to have a balance between contemporary and historic figures. Within that framework, he’s also chosen to honor a few of the outstanding women who’ve had a personal impact on him, like Inuit artist Malaya Akulukjuk. When asked why he included Malaya instead of the more well-known artist Kenojuak Ashevak, he explained that everyone knows who Kenojuak is and she has received many honors. Malaya’s talent and the impact she had are less well-known . . . and Malaya was a friend. Donald Stuart is an outstanding jeweler. A noted goldsmith, he regularly works with precious materials, often creating intricate designs that incorporate seemingly disparate elements. The 40 pieces on display in Homage include plenty of the expected silver, gold, diamonds, and other precious materials. However, they also include a wide range of materials not usually associated with fine jewelry, proving that even the lowliest of materials can become a work of art in the hands of a master. In designing these necklaces (all but one of which are very wearable, according to Stuart’s wife who gets to test them), he looks closely at what makes a particular woman outstanding. Is it her art? Her scientific discoveries? Her business acumen? Her athletic ability? Her courage? Her strength as a mother? Her compassion for others? Using his subject’s key accomplishments as his guide, Stuart then determines how to represent that in a necklace. To do so, he blends materials into pieces that tell a story, sometimes a very literal story, about the woman he is honoring. While these disparate bits, with precious and lowly materials often combined in one piece, may seem an odd mix, in Stuart’s hands they become beautiful and eloquent works of art. The following is a sample of the women and necklaces included in Homage: Inspired by Outstanding Canadian Women. Inuit artist Malaya Akulukjuk (1912-1995) spent the first 50 years of her life living on the land in traditional Inuit fashion. Her career as an artist only began after she moved into Pangnirtung where she began carving in stone, antler, and whalebone. Later she took up drawing, creating designs that were popular both as prints and as woven tapestries. Stuart worked with Malaya at the Pangnirtung tapestry studio, making this piece a homage to both an outstanding Canadian woman and a dear friend. The necklace is made of parka braid from the Pangnirtung Weaving Studio, caribou antler, and a variety of charms (in silver, wool, soapstone, and walrus ivory) that represent various aspects of her life in the Arctic. Elizabeth Arden (1884-1966) began her career as a bookkeeper at a pharmaceutical company, learned about skin care in their labs and then in France, and went on to build a cosmetics empire. An astute businesswoman, Arden was at one point one of the wealthiest women in the world. Arden succeeded in part by changing the way women viewed makeup, turning a product with a negative reputation and limited market into a daily necessity for a nearly limitless market of middle- and upper-class women. This piece was made using 18k gold, pearls, and diamonds. Stuart explains that the costly materials and lush surface of the pearls are intended to convey the glamour and exotic nature of the cosmetics and fashion industry. Born in Switzerland, Sonja Bata (1926-2018) was the face of the Bata Shoe Company in Canada and the owner of the vast collection of shoes that became Toronto’s wonderful Bata Shoe Museum. Bata married into the shoe business, but she took to it with enthusiasm and became an important partner in the business. Accompanying her husband on business trips, she traveled the world as the company sought to expand its international markets. It was during these trips that Bata learned about and began collecting traditional footwear both contemporary and historical. With her interest in architecture, design, craftsmanship, and culture, she saw shoes as a way to understand people’s lives in different times and places. But it seems clear that she also loved shoes for their beauty, and she made sure her beloved collection was both well-cared for and elegantly displayed in the museum she built for them. The necklace Stuart designed to honor Bata features shoes in a wide range of styles. It was made from sterling silver, 14K gold, and leather. This necklace is a good example of the attention Stuart gave even seemingly mundane details. Many necklaces in the Homage collection have clasps that function as an integral part of the design – often to the extent that it’s not obvious that it is a clasp. Others, like this piece, have a traditional clasp, but using non-traditional materials or shapes like the bare foot used here. Born on her grandparent’s trapline in the Yukon, Gringell’s work to advance the rights of First Nations people led her to engage with, and earn the respect of, some of Canada’s most powerful political leaders. She was a leader in negotiating self-governance and land claims, served as commissioner of the Yukon Territory (the first First Nations person to do so), and played a leadership role in a variety of First Nations economic development and public service organizations and projects. Brewer Susannah Oland (1798-1886) took her recipe for brown October ale and turned it into a successful commercial brewery. Although she began the brewery with her husband in 1867, his death a few years later left her to run it on her own while raising six children. That she succeeded is clear, as today that brewery – renamed Moosehead in the 1940s – is still run by her family. It’s also the country’s largest fully Canadian-owned brewery. And you can still buy a beer made from the same recipe Susannah once brewed in her back yard. Stuart’s inspiration for this piece is clear and the materials are basic (Moosehead bottle caps, brass, and a bit of sterling silver), but it’s a classic style and it tells a great story! Inventor Olivia Poole (1889-1975) came to Canada to study music. A talented pianist, Poole perhaps could have gained fame as a musician. Instead she married and had children – which led her to look for a way to keep her babies safe, entertained, and healthy. Growing up on the White Earth Indian Reservation in Minnesota, Poole had watched Ojibwa mothers tie their cradleboards to study tree branches while they worked outdoors. Thus secured, a mother could give the branch a little tug and the baby inside the cradleboard would gently bounce up and down while she went back to her work. With this idea in mind, Poole asked a blacksmith to create a soft spring. She combined her custom-designed spring with a wooden handle and cloth diaper to create the first Jolly Jumper. After creating various Jolly Jumpers for her seven children and many grandchildren, Poole began manufacturing and selling them to the public in 1948. And you can still buy a Jolly Jumper today. 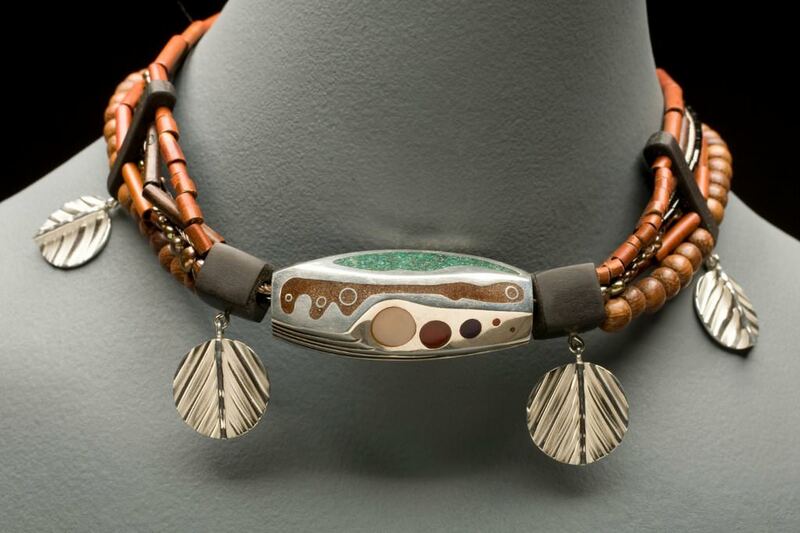 The neckpiece was created from sterling silver, patinated steel spring, and malachite. Who is Donald A. Stuart? Creator of fine jewelry, hollowware, and architectural installations, Donald A. Stuart also works in textiles, wood, and more. Actually, as is clear from the Homage exhibit, there doesn’t seem to be a material he hasn’t worked with! A Canadian native, Stuart studied art in Canada and the USA. He began his career as an artist by establishing a weaving program in the Arctic Inuit community of Pangnirtung. Once he returned south, Stuart joined the faculty at the Barrie Campus of Georgian College where he began innovative programs in weaving and jewelry. Homage is one of the many “retirement” projects Stuart has taken on since leaving his teaching position in 2001. He is also still creating new pieces for sale and as commissions. Stuart holds numerous honors and awards, including Canada’s highest recognition, the Order of Canada. Interested in seeing more of Donald Stuart’s work? Check his web page for current work, commissions, and more or view the Homage exhibit virtually at Homage: Inspired by Outstanding Canadian Women. Take a virtual tour of Retrospective: 50 Years of Creative Excellence, a retrospective of Stuart’s work at the Simcoe County Museum near Toronto, Canada. Stuart is also a wonderful speaker, so if you have a chance to hear him, get it on your calendar. You won’t be disappointed. 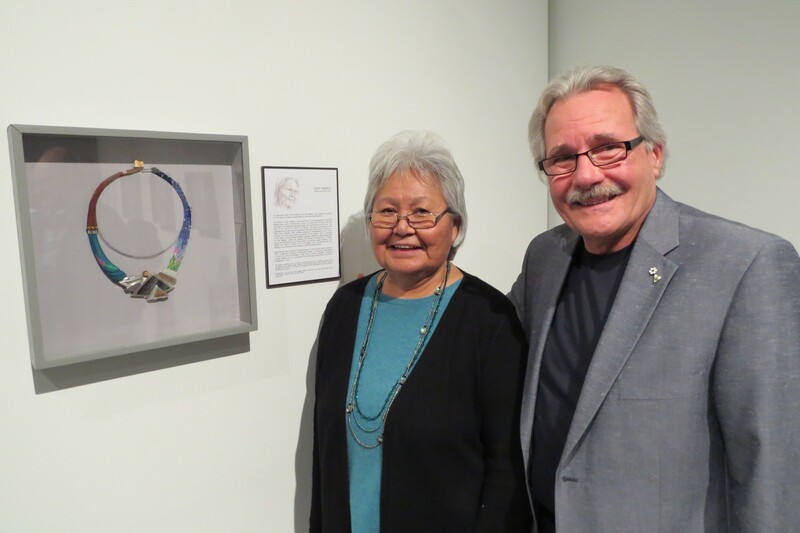 I got to walk through a portion of the Homage exhibit at the Dennos with Donald Stuart, an opportunity that came my way because of his connection with Inuit art. From 1969-1972 Stuart lived in Pangnirtung, an Inuit community on Baffin Island. His job there was to teach the Inuit to weave as a way to bring income into the isolated community. While the Inuit had no experience with weaving, under Stuart’s direction they took to it like fish to water. Now, 40 years later, the weaving studio he started is producing ever more complicated tapestries that celebrate Inuit culture. Homage: Inspired by Outstanding Canadian Women will only be on display at the Dennos Museum Center in Traverse City, Michigan, through January 20, 2019. The show consists of 40 framed art necklaces that celebrate Canadian women past and present. Created by contemporary Canadian jewelry artist Donald Stuart, the pieces cover a wide range of styles and materials. Along with the framed necklaces, the show includes sketched portraits by Susan Benson (who also curated the show) and brief biographies of the women featured. This is a beautiful show, so you should see it now in Traverse City! Traverse City is located in northern Michigan on Lake Michigan’s eastern shore. It’s a bucolic area known for cherry blossoms in spring, sandy beaches in summer, and brilliant colors in fall. But Traverse City has a lively historic downtown and would be a fun spot for Christmas shopping. And there are plenty of great bars and restaurants to warm you on a cold winter day. Of course, you can also find a full range of winter sports if you are the outdoorsy type! Traverse City is about a two hour drive north of Grand Rapids. It’s a gorgeous drive most of the time, but watch the weather if you are traveling this winter. And be aware that weather can change quickly along the lake. Several major airlines offer flights from Detroit to the Cherry Capital Airport in Traverse City. The Dennos Museum Center is part of Northwestern Michigan College. It’s located right in Traverse City. The museum has a significant collection of Inuit art, as well as notable Canadian Woodland Indian art and outdoor sculpture collections. Newly remodeled and expanded galleries provide a beautiful setting for exhibitions of all types of art. It’s a wonderful small museum. I provide links as a convenience to you. Some of these may be affiliate links that pay me a small commission if you use them to reserve a room or purchase goods or services. You don’t pay anything extra for using these links, but it helps keep this website running. To learn more, review this website’s policies and disclosures.